Before I begin, a word about spoilers: I am a spoiler-phobe and would never want to read a spoilery review of a book I haven’t read, therefore I try to avoid spoilers as much as possible. However, I understand that everyone has their own definition of what constitutes a spoiler so I can’t make any promises. In addition to that, as this is the fourth book in a series, I cannot really review it without giving away at least some spoilers from the previous books. If you have not read them, I suggest you do. Then you can check out my reviews for Throne of Glass, Crown of Midnight, and Heir of Fire before coming back here. I will allow spoilers in the comments for anyone who wants to discuss their thoughts/opinions on the book. So if you haven’t read yet and want to avoid spoilers, then skip the comments (or don’t read too closely). You have been warned. Now, onto the review. In Queen of Shadows Aelin Galathynius has finally embraced her heritage and returns from Wendlyn ready to take up the battle against the King, find the wyrdkeys and stop his plan. First, she must rescue her beloved cousin Aedion then deal with her former master, Arobynn. Along the way she makes some new friends and allies, new enemies and begins to form the backbone of her future court. I’m always a little hesitant about getting into a YA series because most of the ones I read tend to lose something somewhere along the way and often end in disappointment. It happened with Divergent, The Hunger Games, The Tiger’s Curse, The Mortal Instruments … and the list goes on. The most impressive thing about the Throne of Glass series is that we are now four books in, and it has showed no signs of slowing down. 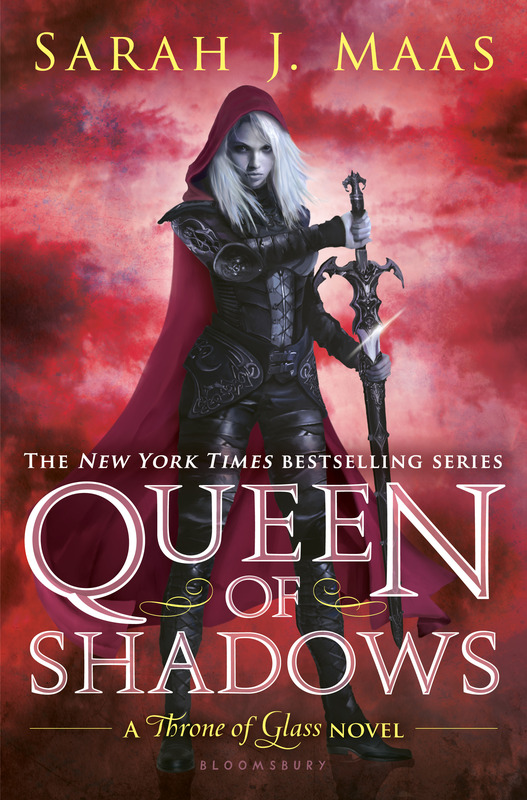 Queen of Shadows picks up not long after Heir of Fire ended – with Aelin’s arrival in Rifthold. The fact that the narration has changed to Aelin proves that she’s maintaining the commitment she made to herself and her destiny while in Wendlyn. Celaena Sardothien no longer exists – except for a few times Aelin must wear that mask throughout this book. It’s an interesting choice to completely change the identity of your main character halfway through a series, but Maas made that transition with us in Heir of Fire, so it only felt natural to think of her as Aelin and not Celaena now. We get to see a lot of characters interacting for the first time in this novel, and I really enjoyed those interactions a lot. There are also two new characters introduced: Lysandra, a courtesan and former acquaintance of Aelin’s and Nesryn, Chaol’s new lieutenant in the rebellion. I’m going to be honest and say, while Chaol has been one of my favorite characters through this series, I really just wanted to strangle him through most of this book; he was so frustrating. I think I’m finally okay with Aelin moving on from Chaol. It was nice to see Aelin making female friends again, since most of her interaction since Nehemia’s death has been just with men. One thing I was happy to see was the continuation of Manon’s arc along the same path I suspected from Heir of Fire. Manon is such a fascinating character – born to be wicked and bloodthirsty and unforgiving, but in Heir of Fire she showed some signs of something more. I really enjoyed seeing her character, and other members of the Thirteen, developed more in this novel. I’m curious about what role they’ll play in the final battle (which has already had a couple changes to the lineup that I wasn’t expecting). I really enjoyed this book and was so happy it did not disappoint. This series is definitely restoring my faith in YA series, and in strong female characters within a YA series. Lol are you talking about Manon and Dorian? Or Lysandra and Aedion. I’m still team Dorian but I’m assuming you’re probably team Rowan. I am too but there’s reasons why I don’t think they’ll work out.I think I’m going to start on my review today. Huh, you’re right. Everything I had read previously referred to 5 novels, but her website does say 6. Interesting. Because I feel like it could be wrapped up in just one more. There must be another twist she’s planning for the next book. And I am definitely Team Rowan after this book, though if there’s two more there’s still time for her to choose Dorian I suppose. But I just never thought Dorian felt right. They make sense – uniting the two kingdoms, and given the display of power at the end of this novel, but I just didn’t feel them the way I do Aelin and Rowan (or even Chaol, but I’m done with Chaol, lol). I honestly think Dorian and Mannon could be interesting. There’s definitely something more there to explore. Part of me also worries that there may still be some darkness in Dorian, which could be part of the twist she’ll use to make two more books. I actually don’t think that it could’ve wrapped up easily in the next one , unless she made it a pretty big book. There’s still a lot of unfinished story lines that I don’t think she could all fit into one book. Rowan and Aelin I’m certain aren’t going to last because she introduced it too early. That’s why I was fine with her being with Chaol in Crown of Midnight, because it was too early for her to be with Dorian. So that’s why I’m positive her and Dorian are endgame. And that scene in the tower! That scene.. Even Rowan couldn’t beat that. I actually think Manon and Rowan are gonna end up together. They’re both immortal and I think I could see it lol. I can see it being more than one novel if they deal with Perrington in one, then Maeve in another. However it happens, I’m sure it won’t disappoint, since Maas hasn’t so far. I love Dorian, but I just don’t know about them being endgame (though he is definitely much better than Chaol, since he’s willing to accept all of Aelin). Even when they were together in the first book I wasn’t sure how I felt about that (of course at the time I still preferred Chaol). I guess we’ll just have to wait and see!